FORT RECOVERY — Grant Besser stepped into the box with two outs and the bases full. The potential game-tying run was less than 90 feet away leading off from third. The go-ahead run was near second. He watched Riley Will's pitch go by for strike one. Three pitches later the count was even. Besser ripped Will's 2-2 offering to deep left center field, but Regan Martin was there to track it down to end the game. 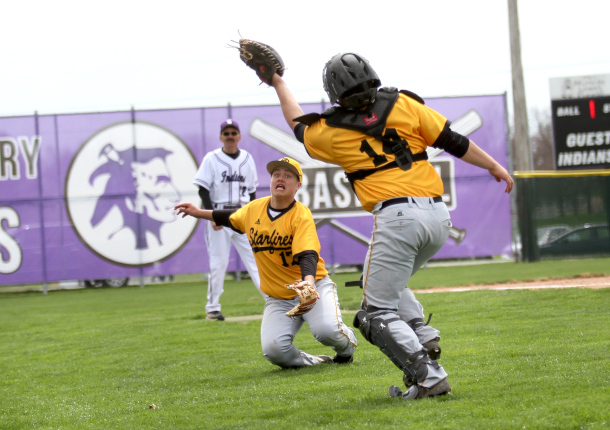 After dropping the first game 3-0, Fort Recovery High School's baseball team gave up one run in the top of the seventh but hung on to win 7-6 and salvage a doubleheader split with the South Adams Starfires on Saturday. Fort Recovery coach Jerry Kaup said the stressful situations only made his team, and the Starfires, better ball clubs. “It was a great baseball for both teams,” he said. “Both teams grew during that game. By that I mean both of these two teams hope to be in some very important games down the road, and if you're going to be in those games down the road you're going to have to play in that atmosphere. Cole Grisez hit a two-run single as part of a four-run second inning for Fort Recovery (8-3) in game two, which put the Tribe out front 5-0. But South Adams responded with four runs in the third — Austin Gorney drove in a pair on a single and AJ Dull had a squeeze bunt for an RBI — to trim the margin to 5-4. Fort Recovery added an insurance run in the fourth inning before Besser entered with bases loaded. A wild pitch brought home Jacob Homan for a 7-4 FRHS advantage. But the Starfires still mounted a comeback with six outs remaining. Nic Stuber hit a sac fly in the sixth inning to make it 7-5. An inning later, Nick Miller scored on a wild pitch from Will to put pinch runner Conner Young at third base as the potential game-tying run. Alex Gorney walked to load the bases with two outs as South Adams rolled its lineup to the Besser at the top of the order. South Adams sophomore Adam Besser shut down Fort Recovery in the first game. He scattered two hits over seven shutout innings, struck out six and didn't issue a walk. Ryne Post reached second on an error in the third inning, and Homan did the same in the seventh, but no other Indian base runner reached third. Collin Shaffer hit a two-run double to put South Adams ahead 2-0 in the second inning, then sacrificed himself with a fly ball to Martin in center to score Grant Besser in the fifth. Shaffer finished the day with a double and two singles, while Besser had three singles. Miller and Stuber also collected two singles, and Stuber drew three walks in game one. Riley Post had two hits in game to as the top FRHS hitter. Joe Homan knocked in a pair of runs for the Tribe. Buckingham's biggest takeaway from the doubleheader is something that can also be attributed to the Indians as well, as both teams feature relatively inexperienced rosters. “It's always good to see, we got a lot of young players that I haven't seen in different situations,” Buckingham said. “It also exposes some youthful issues, things to work on.